Celebrity Cosmetic Surgery: What is going on with Lil Kim? 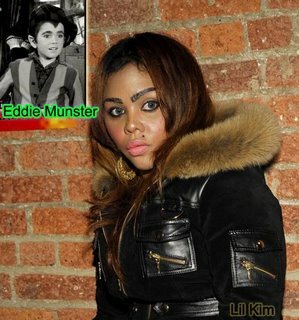 ...She looks like Gizmo from Gremlins. How disturbing. Oh totally. If you compare her looks now to her mugshot on smoking gun it's quite scary. I wish a doctor would reach out to Kim and offer her help. She's had a troubled life and is surrounded by people who don't want the best for her and I think she is confused. She just wants to be pretty and she is a real sweet heart so it saddens me that she is doing this to herself. I think if it weren't for the oversized cheeks, dents in her nose (caused by a poor nose job), and her oversized breasts, she would be quite good looking. I hope she gets this fixed! Was the comment about BDD used facetiously? How can she have BDD? Reading about her she seems to have a pretty active life and is an outgoing person. Isn't the main criteria of BDD when someones perceived "ugliness" begins to severely impair (social withdrawal, avoidance, depression, absenteeism) their life? I don't see how that applies to her. Granted all I know about her is reading a brief Wikipedia bio. Anyhow, I think people should refrain from trivializing real BDD suffers (and they suffer greatly) by labeling anyone who gets "excessive" plastic surgery or desires to be pretty (what person doesn't?) as having BDD. Fact Check: BDD doesn't mean you are agoraphobic...sadly so many people suffering from it are, or have agoraphobic tendancies...but many people with BDD can function at least fairly normally, as in they go to work, school, go out..yada yada...but under a seemingly happy outside, they are hiding a deep deep sense of worthlessness inside. Agoraphobia would best be described as a symptom of severe BDD. I have BDD and I am highly functioning....I used to have major issues with social interaction...I'm good with that now...but I still suffer from BDD everyday....it's just I manage it. SHE DOES LOOK WEARED ON THIS PHOTO .... BUT I THINK SHE LOOKS GREAT NOW! !